The 8th Annual Positive Feedback Online’s Writers’ Choice Awards for 2011 – The Best of the Best! The Townshend Rock 7 Turntable has been my reference for over a year now, well before it started receiving attention in the U.S. audio press and mentions at many audiophile shows. I’ve sat down to write a review of this turntable several times over the last year, but I was forced to stop due to continuing changes in my reference system, involving the turntable or other components. Each change resulted in better and better sound enabled by the transparency of the Rock 7. A full review is forthcoming but I didn’t want to wait another year before giving this special turntable the recognition it deserves. 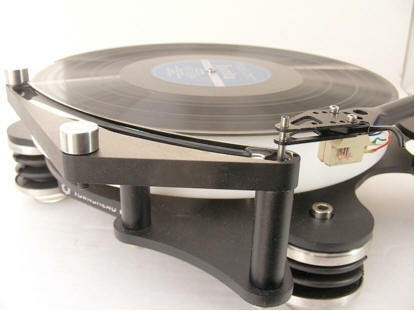 The Rock 7 ranks with other turntables that cost $10K or more yet has a list price of about $3000 (without tonearm). Think of all the extra LPs you could buy for this difference! The Rock 7 has a unique suspension system that effectively isolates the turntable from outside disturbances, but its most noteworthy feature is the amazing “trough”, filled with damping fluid, that the tonearm headshell floats in. Damping provided by the trough smooths the bass response and controls other resonances in the cartridge/tonearm system that muddy the sound. Music through the Rock 7 emanates from a dead silent background and the action of the trough sharpens transients and lifts veils that otherwise obscure inner detail. The result is that music literally explodes from the groove and provides a sense of musical flow that I was never aware of before. Whether you have a $100 cartridge or a $5000 cartridge the Rock 7 will get the best out of it. It requires some tinkering to sound its best but worth the effort. Highest recommendation!